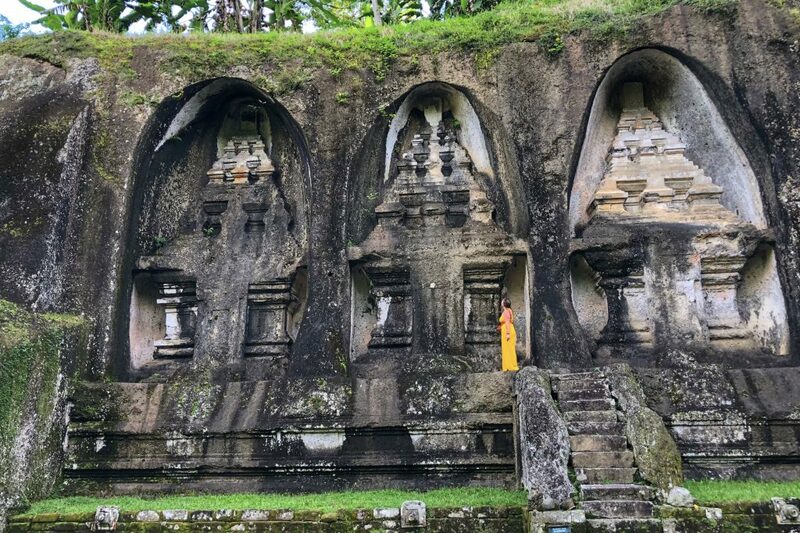 Gunung Kawi Temple is known for its huge carved stones called “shrines.” These shrines date back to the 11th century making it one of the oldest Hindu temples on the island. So, you can see why many would put this on their Bali bucketlist. 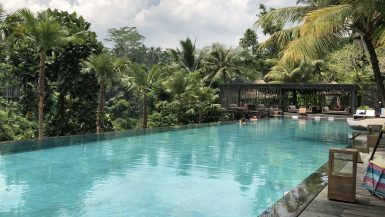 Surprisingly enough, I was unaware that this place existed until I met a local at the Kecak Cafe where he told me all of his recommendations around Ubud. The same man ended up taking a trip to the temple with me and enlightening me about the history behind the stone. Upon entering, you’ll be checked to make sure you are wearing respectable clothing. 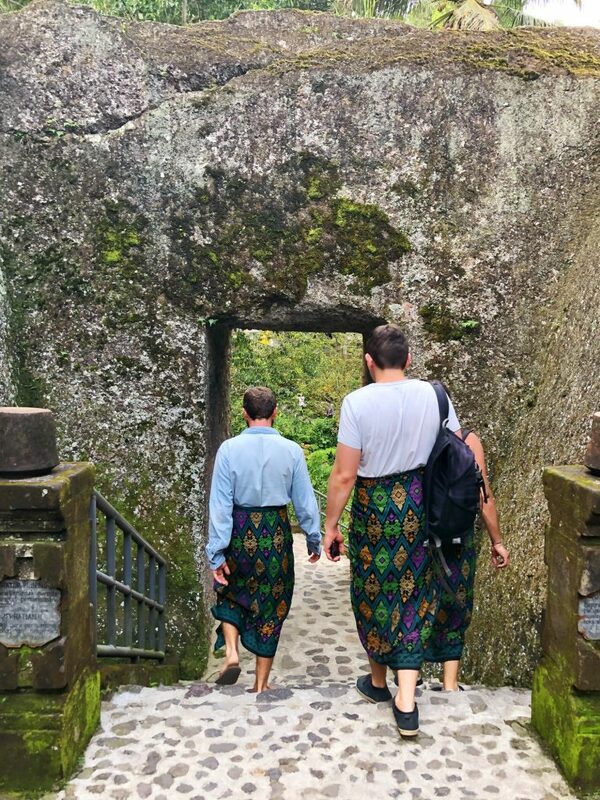 If you are not covering your knees, you’ll be asked to wear a sarong (shown in the picture above). You may bring your own. If you do not have your own, you may borrow one until you are done visiting. If you’re covering your knees, like I was, you’ll only be asked to tie a belt around your waist. I also recommend wearing good shoes. The only way to get to the temple is to climb up and down over 200 stairs. It definitely is a little hike. Therefore, make sure you are comfortable so you do not hurt yourself on the way to see the beauty! This temple is approximately a 30 minute drive, North, from the center of Ubud. It is only a 15 minute drive, East, from the Tegallalang Rice Terrace. The entrance fee for Gunung Kawi Bali is extremely cheap. It costs 15,000 RP per adult to enter. This is about $1.00 in USD. Not too shabby, right? Like I said above, the walk down requires going through over 200 steps. Since the walk is lengthy, there are many shops lined up along the way in hopes to attract the tourists. These shops include souvenirs, clothing, refreshments, etc. It is a great reason to stop if you get too exhausted on the way down or up. Personally, going up was much more difficult than going down. Chances are, you’ll most likely agree. The shrines (see picture below) are what the people come to Gunung Kawi Temple to see. These shrines a carved into the side of cliffs with such intricate detail! They stand to be about 8 meters tall (around 26 feet tall). Although the picture below only shows five, there are actually 10 altogether. Once you finally get past all the stairs, you will find yourself at a T with two paths. One path will lead you to 5 of the shrines, while the other path takes you to the other 5. Of course, I recommend checking out both paths. The path to the left was my ultimate favorite, though. These 5 shrines were carved alongside the river which allowed them to make fountains for what they consider “holy water.” You are able to walk down to the river if you would like. The left path also has an area of small rooms that were carved from the cliff’s stone. These small rooms are used for meditation. You are required to take off your shoes before entering this area. With the river close enough to hear, it is a wonderful location for those looking to calm themselves. 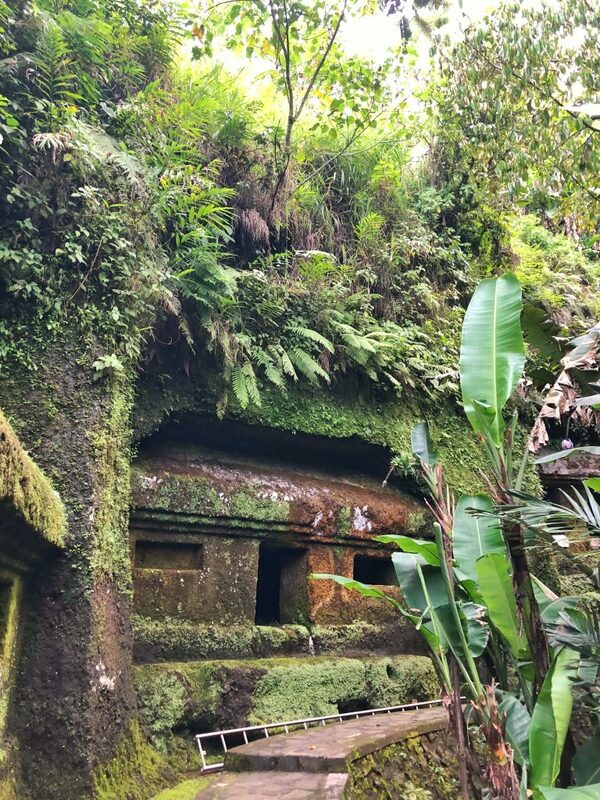 So… why does Gunung Kawi Temple exist? Why did people feel the need to design these huge rocks? 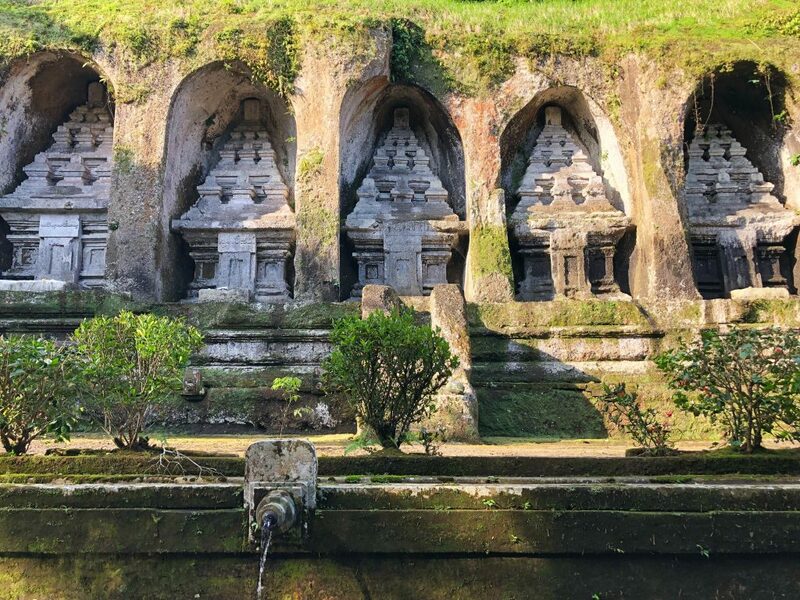 These beautiful pieces of artwork were carved for King Udayana, a previous king in Bali. Okay, it’s not really a secret but that’s what I call it because I walked past it without even noticing it was there. The only reason I took the walk was because my new friend had mentioned that I HAD to go down this pathway. Then, once I started taking the walk, I realized I wasn’t the only one that had missed it. There was absolutely NO ONE there except us two. 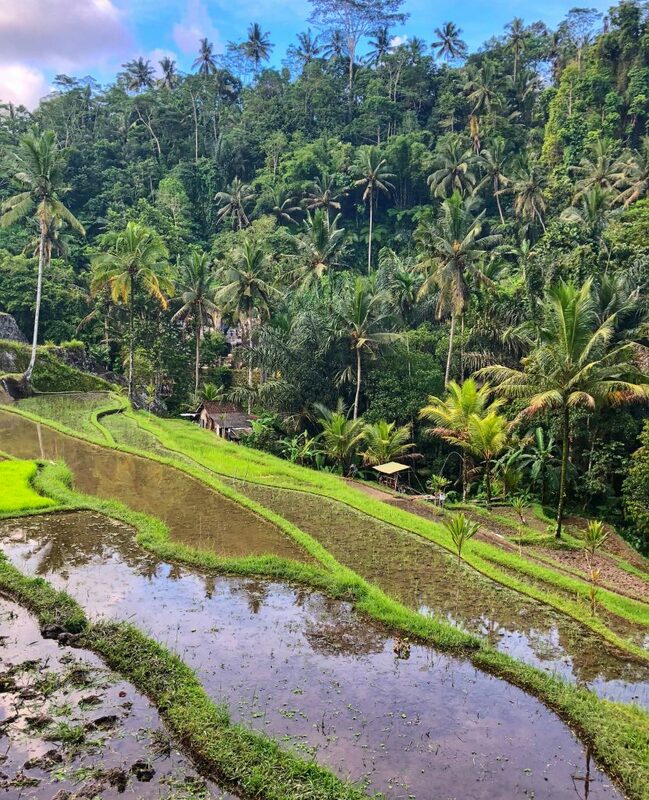 Whenever you are walking from the entrance, down the stairs, and get to the part where you see the rice fields, the walk is to the right (just before the fields). You’re actually walking alongside the rice fields (see previous photo of the rice fields and palm trees). The view is amazing from this walk and then it leads you into what looks like a jungle area (see photo below). The walk ends up being a dead end, but still worth the trip. Careful though! When I went, it was very slippery. Watching where you step is very important. Toward the end of the walk, you’ll see homes built into the stone of the cliffs. It’s honestly amazing how unique the architecture of the 11th century in Bali was. I hope you all get the chance to see Gunung Kawi Temple! 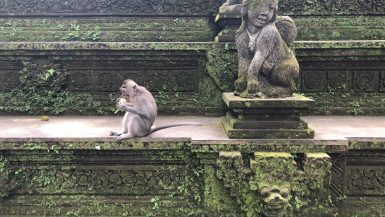 Have you been to Gunung Kawi Temple in Ubud? 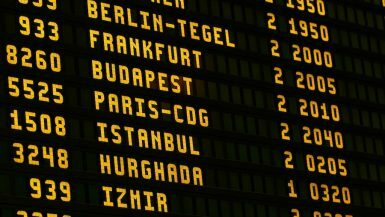 Tell us about your adventure in the comments below!